You receive (5) tables and 10 benches for the price listed plus free shipping to a business loading dock within the Continental US! Authentic Oktoberfest picnic table sets from the legendary beer halls of Germany. Great for brew pubs, restaurants, pizzarias, ice cream shops, outdoor cafes, family gatherings, parties on patio, deck and lawn. Reunions, weddings, anniversaries. Keep in the family for generations to come. Beware of cheap knock-offs that will not last a season. These are the real deal. Heirloom quality. A long-term investment in summer fun. 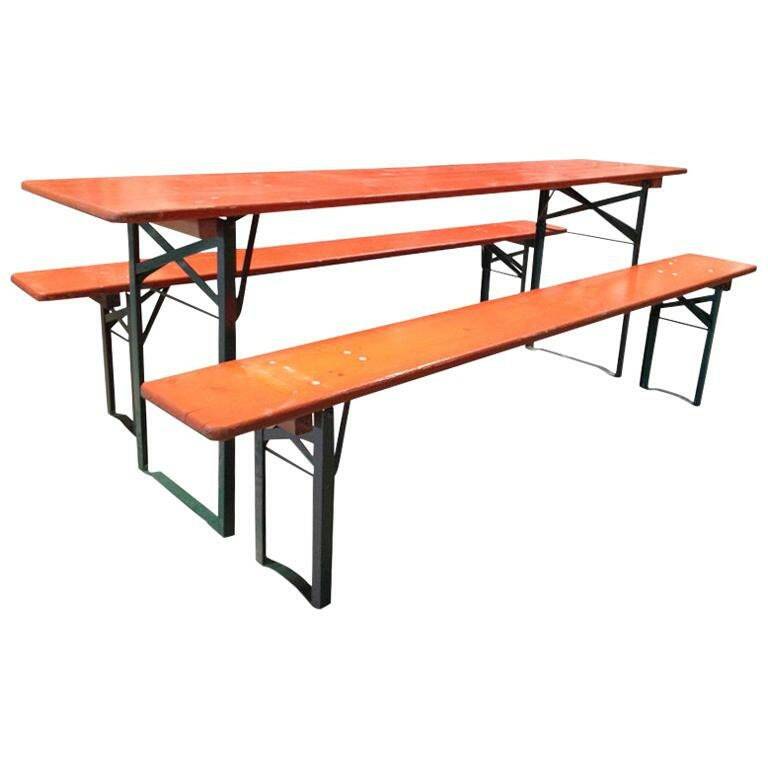 Each set includes two benches and table. In red/orange Oktoberfest colors with green steel legs. Heavy duty hardware, solid wood top. Leave it outside during summer. Enjoy it inside during winter. Folds up flat and easily for compact storage. Each table is unique in coloration from those shown in photo and has reasonable vintage wear from use and age. We inspect and tighten all hardware, smooth rough edges, coat with polyurethane for outdoor use. Bench 86.5" L x 10.5" W x 18" H each. H 30.0 in. x W 87.0 in. x D 20.0 in.